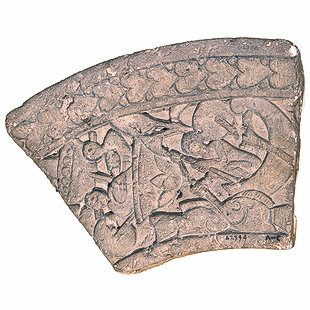 This is part of a cornice with ornaments showing a person fishing from a boat. There are two fish, some lotus flowers, some plant leaves, and a bird in the scene. This piece of art is surrounded by a border of heart-shaped leaves. This scene is influenced by ancient Egyptian art, which depicts the owner of the tomb fishing in a boat in the swamps of the Delta. There are always two bolti fish in the scene. 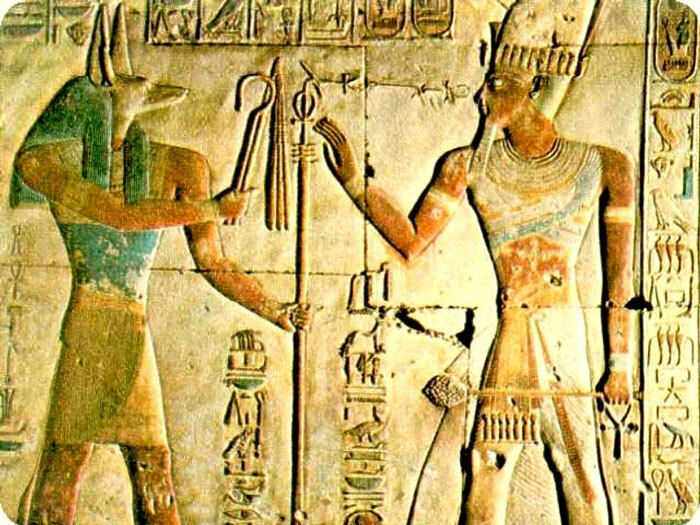 Fish, in ancient Egypt, had an important role in purifying the heart of the deceased before the beast, Abu Fis, appears. The fish then serve to protect the deceased from perdition. In Christianity, fish are linked with the Lord Jesus Christ and with the Last Supper, as well as with the Lord's Miracle of the Loaves and Fishes. Fish are also associated with the fish in the Book of Tobit, the Third Book of the Apocrypha of the Old Testament.